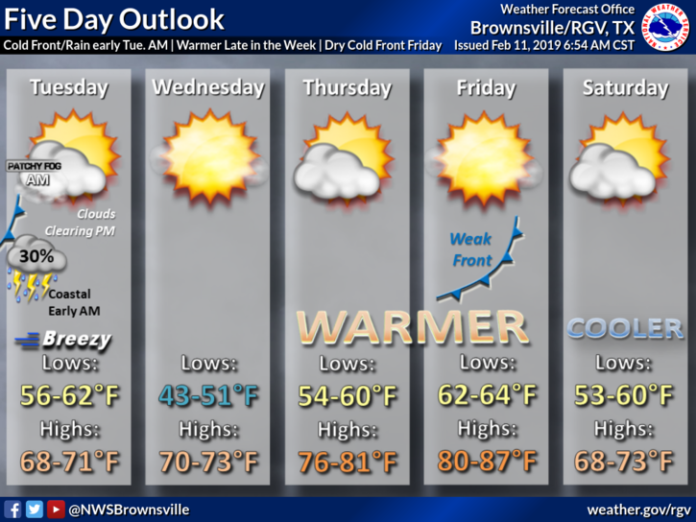 A foggy and drizzly start to the day will turn into a mostly cloudy/partly cloudy day across the Rio Grande Valley on Monday, according to the National Weather Service in Brownsville. Expect highs in the upper 70s and low 80s with the possibility of mid 80s in some areas. McAllen and Brownsville will reach 84 and 78 degrees, respectively. A cold front with rain and the possibility of isolated thunderstorms will move into the area Monday night that will cool temperatures on Tuesday, when lows will range between 56 and 62 degrees and highs will be in the upper 60s and low 70s. Cooler temperatures will really be felt on Wednesday morning, when low temperatures will drop into the upper 40s/lower 50s.